Untitled, 2007, C-print mounted on aluminum, 60 x 40“. 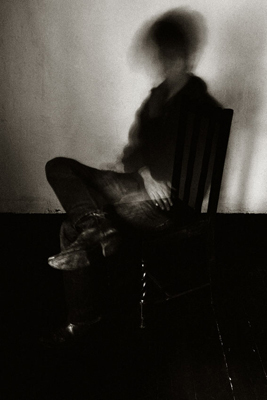 From the series ”Confessions," 2007. David Birkin, a member of the loose movement of artists whose attempts to communicate emotion through aesthetics have led some commentators to call them the “new romantics,” brings together three works, all from 2007, for his first solo exhibition. The five photographs that make up his series “Confessions” depict members of his family, each of whom divulged a secret while alone in a room facing an antique still camera, opening the shutter when the confession began and closing it when it ended. The length of the confession thus dictated the duration of the exposure for the resulting photograph. In choosing the Dickinsonian theme of “the letting go”—transcending (and shedding) pain and anxiety after a traumatic event, “moving on”—Birkin considers sorrow and the surmounting of grief through the passing of time. What is crucial for Birkin is the casting off of an emotionally restrictive “skin”: the metaphor, not the words, of confession. The undisclosed, anonymous nature of admission is what holds his attention, rather than a desire to know the minutiae of the sins admitted. Haunting and grainy, the images muddle the confessors’ body language, making them appear jumpy, as if they are about to take flight, or like distorted shape-shifters scrabbling about in an inky underworld. On the opposite wall, titled after a phrase of Saint Paul, is According to the Flesh, a triptych of videos that scrutinize bodily functions in slow motion with a macro lens. An eyebrow hair is plucked, a nail is clipped, and a tear is shed so slowly that the viewer is forced to direct attention to the involuntary and deliberate processes of “letting go” that the mutable body itself undergoes. Letting go of profound secrets without fear of admonishment is the essence of Thought, Word and Deed, which centers on an actual confessional box from the nearby St. Matthew’s Church and invites viewers to spill the beans into a tape recorder instead of the ear of a priest. As it feeds out, the tape loops around a magnet and so annihilates the recording that has just been created. To whisper in that gloomy box is to sense a stifling sense of enclosure and, at the same time, a somewhat cathartic freedom. For better or worse, one's secret stays a secret.